LOS ANGELES – Through their exclusive partnership, Delta Air Lines and the Lakers are joining forces to launch the season-long “Salute To Our Troops” program, beginning at the Lakers home game on Nov. 11, 2018. Launching on Veteran’s Day, this special program will honor U.S. military living and stationed in Southern California, highlighting their career paths, unique journeys and commitment to serve our country. In addition to in-game recognition, each honoree will receive tickets to that night’s game, a custom Lakers jersey, a challenge coin and the opportunity to attend a Lakers practice to meet players and coaches. Honorees will be selected in conjunction with the Bob Hope USO. Additional games nights where military personnel will be honored include December 10, January 4, February 27, March 4 and March 29. Delta has been the Official Airline Partner of the Lakers since 2010. Since 2009, Delta has been the fastest-growing carrier at LAX, more than doubling its number of seats and growing from 70 daily departures to more than 175. The airline continues to build on its efforts to serve the specialized needs of customers in the Los Angeles entertainment, production and tech industries through nonstop service to top industry destinations, exclusive partnerships that provide in-flight content on Delta Studio, and curated travel experiences like the Delta Festival Shuttle. Delta’s commitment to Los Angeles also means more than providing exceptional service in the skies and on the ground at LAX. Its 4,200 LA-based employees are also deeply integrated into the community, working with organizations and supporting causes that are near and dear to the hearts of Angelenos. Delta Air Lines serves more than 180 million customers each year. In 2018, Delta was named to Fortune’s top 50 Most Admired Companies in addition to being named the most admired airline for the seventh time in eight years. Additionally, Delta has ranked No.1 in the Business Travel News Annual Airline survey for an unprecedented seven consecutive years. With an industry-leading global network, Delta and the Delta Connection carriers offer service to 302 destinations in 52 countries on six continents. Headquartered in Atlanta, Delta employs more than 80,000 employees worldwide and operates a mainline fleet of more than 800 aircraft. The airline is a founding member of the SkyTeam global alliance and participates in the industry’s leading transatlantic joint venture with Air France-KLM and Alitalia as well as a joint venture with Virgin Atlantic. Including its worldwide alliance partners, Delta offers customers more than 15,000 daily flights, with key hubs and markets including Amsterdam, Atlanta, Boston, Detroit, Los Angeles, Mexico City, Minneapolis/St. Paul, New York-JFK and LaGuardia, London-Heathrow, Paris-Charles de Gaulle, Salt Lake City, São Paulo, Seattle, Seoul, and Tokyo-Narita. Delta has invested billions of dollars in airport facilities, global products and services, and technology to enhance the customer experience in the air and on the ground. Additional information is available on the Delta News Hub, as well as delta.com, Twitter @DeltaNewsHub and Facebook.com/delta. Bob Hope USO is the fastest growing USO operation in the country, and this year will serve 200,000 troops and military families across eight Central and Southern California counties spanning more than 50,000 square miles. With four airport centers and regular morale and welfare programs and events at two dozen military installations, Bob Hope USO is the premier non-profit organization in the region supporting our service members and their families. Leveraging the power of more than 650 volunteers and a small staff, for 75 years Bob Hope USO has delivered a "touch of home" both here and abroad and kept our troops connected to family, home and country. Sustained entirely by private donations, Bob Hope USO carries on the work of our legendary namesake, famed entertainer Bob Hope. Find out more at BobHopeUSO.org. 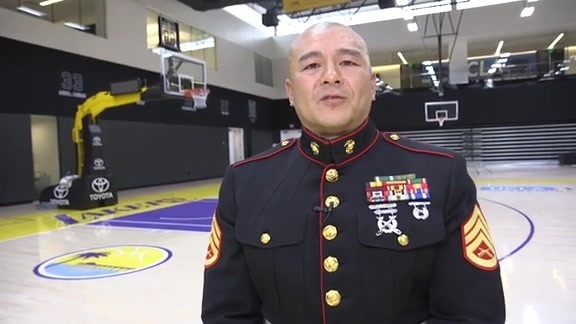 As part of Delta’s Salute To Our Troops program, Alan Coleman of the Marines got an unforgettable experience watching the Lakers battle the Clippers. 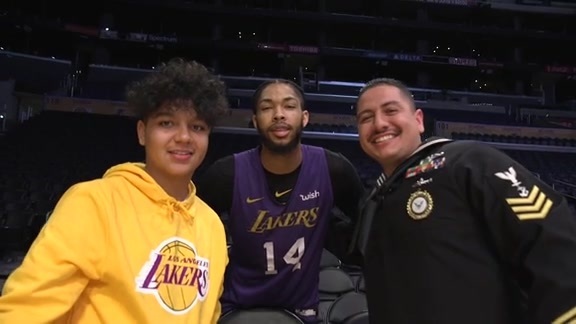 Petty Officer 1st Class, U.S. Navy Anthony Jimenez visited the UCLA Health Training Center to meet some of the Lakers' players, and then joined them at STAPLES Center on January 24th for their matchup against the Timberwolves. 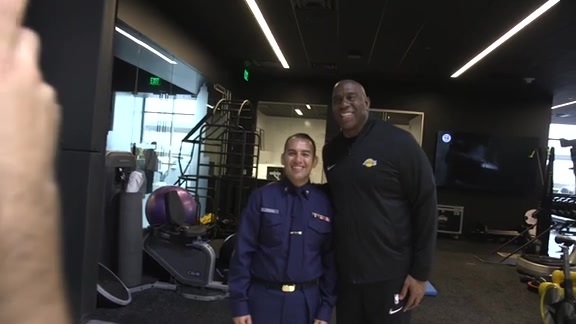 Yeoman Second Class Anthony Arevalo joined the Lakers at their practice facility for a quick tour, and then headed down to STAPLES Center to be honored on the court and watch the Lakers take on the Heat. 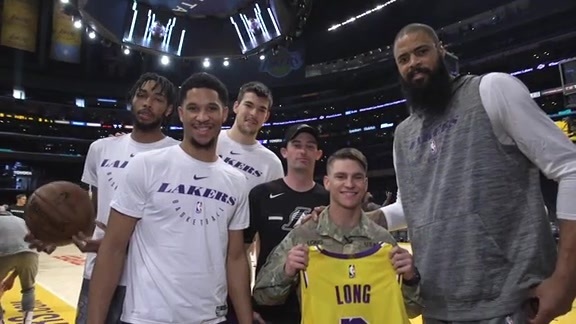 Sargent Josiah Long took a trip to the UCLA Health Training Center to meet some of the team, and then joining them at STAPLES Center to see the team take on the Atlanta Hawks.